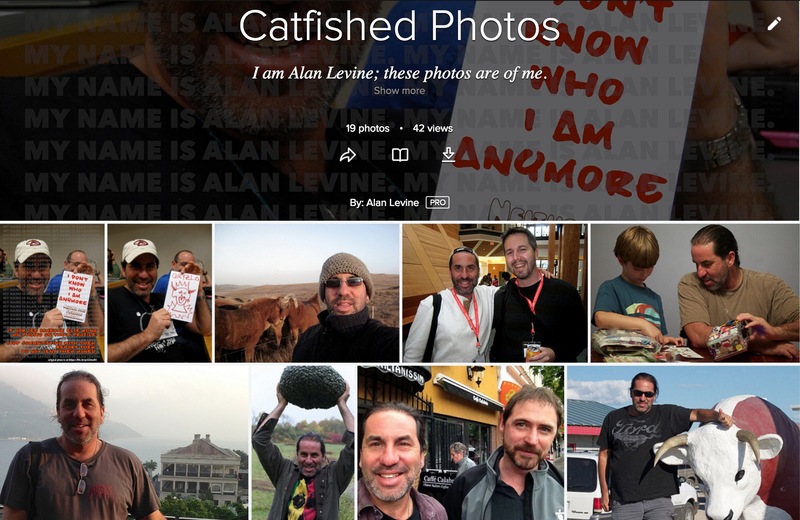 Hi there, my name is Alan Levine. You may have come across someone online using my photos pretending to be a person of another name. By having perhaps performed a reverse image search you discover that those images of “Doug” or “Carlos” are actually ones of me. Welcome to the weird world of catfishing and the scams stink as bad as the fish. If I have shared this page with you, there is a good chance that you’ve been the target of a romance scam (aka catfishing). You may have been led to believe that you are in a relationship with someone who looks like me. I am afraid to let you know that you have been fooled. The photos are me; the person? A fake. Everything they told you is a lie. Many of the photos these scammers use come from my own online photos — see my Facebook album (no longer available) and a flickr set of photos (plus a larger number of tagged flickr images) known to have been used in fake profiles. However, you should know that scammers have been using my personal photos for several years to deceive women in the hopes of defrauding them of money or assets, or “romance scams”. If you have fallen victim in one of these scams, the information below may help some. It cannot fix the hurt, shame, and worst case, financial loss. I will read your messages, will try to help identify original images, but I cannot become involved in your situations. Please do not follow me on social media or send me repeated emails. For my own sanity’s sake I cannot be your friend and whomever you imagined I was, I am not that person. I have been doing my best to bring this to the attention of the media and to social networks such as Facebook, Google, Skype, etc. However, there has been little to no response from these companies, and it is my strong belief that these corporations, in their lack of action against this growing problem, have now become complicit in these illegal activities. If you are interested in learning more about my experience with these romance scammers, please read my blog posts about this topic, an article I published on medium, or a presentation I have done for university students. I’ve written quite a bit here at CogDogBlog about my experiences (a few of these have strong language). What I can offer is sadly not much. And this is especially true if you have just discovered that you have been scammed, which means you are either in a place of shock and or shame. My identity has not been stolen or comprised. An an educator I have an easy to find presence online. Most victims find their way to me after doing a reverse image search. If you live in the United States, file a report with the FBI’s Internet Crime Complaint Center – this does not mean the FBI will investigate but if they get reports from multiple victims it might raise their awareness. Report the fake accounts to the service where they have established fake profiles. Admittedly this does almost nothing, these scams use software that allows them to create multiple fake accounts easily. In my experience Facebook is very inconsistent in their “reviews” of accounts, sometimes taking them down quickly, other times it takes weeks or never. I have found that the more effective options are to report an account as fake, and the next option of “they are impersonating someone” — this works better if that person is a Facebook friend. It also seems to help if you can ask other people to report the accounts. Recognize that they used well-honed psychological tricks to prey on your vulnerabilities. After some period of often long online courtship, at some point they will ask for money. It might be to help them out of a financial bind (where they are cast as a victim, e.g. an ex), it might be to help them set up a business, it might be to supposedly buy a plane ticket to visit you. DO NOT SEND THEM MONEY! Once you discover their deceit, ignore all of their efforts to contact you. Block their numbers, delete any social connections, and do not respond to any of their efforts to reach you with some concocted story. I am sorry this has happened to you. You are not stupid, you have been tricked by a professional scam artist. What you can do is report their profile as fake, and what would really help is to tell other people what has happened. It does not make you a fool or stupid, it makes you a victim, and there are a lot of victims. And that was so much fun, right, that it got me thinking: like, what would happen if I just spent as much time as could replying to as many scam emails as I could? And that’s what I’ve been doing for three years on your behalf. Crazy stuff happens when you start replying to scam emails. It’s really difficult, and I highly recommend we do it. I don’t think what I’m doing is mean. There are a lot of people who do mean things to scammers. All I’m doing is wasting their time. And I think any time they’re spending with me is time they’re not spending scamming vulnerable adults out of their savings, right? Thank you for turning this issue into a refreshing and enlightening education. I’m also taking to heart your theory that if we keep them “on the hook” less people will hopefully be spared. Searching google images has helped me catch and hopefully embarrass quite a few. I enjoy the challenge of letting them know that I am smarter than they think I am! And finally, here are some useful resources for learning more about romance scams including support groups that are dedicated to raising awareness, reporting fake profiles, and ultimately stopping these scammers. This video is a tad over the top and has NSFW / child in-appropriate language, but does offer a simple test you can ask someone you are chatting with online… ask them to send you a photo touching their ear with their pinky finger, a rather unlikley pose they will find online. This page is modeled after the one by Alec Couros, another educator who has been dealing with this situation even longer than me.